This article is about the Russian Tsar. For other uses, see Boris Godunov (disambiguation). Boris Fyodorovich Godunov (/ˈɡɒdənˌɔːf, ˈɡʊd-/; Russian: Бори́с Фёдорович Годуно́в, IPA: [bɐˈrʲis ɡədʊˈnof]; c. 1551 – 23 April [O.S. 13 April] 1605) ruled the Tsardom of Russia as de facto regent from c. 1585 to 1598 and then as the first non-Rurikid tsar from 1598 to 1605. After the end of his reign Russia descended into the Time of Troubles. Boris Godunov was the most noted member of an ancient, now extinct, Russian family of Tatar origin (Chet), which came from the Horde to Kostroma in the early 14th century. This legend is written in the annals dating from early 17th century. He was descended from the Tatar Prince Chet, who went from the Golden Horde to Russia and founded the Ipatiev Monastery in Kostroma. Boris was the son of Feodor Ivanovich Godunov "Krivoy" ("the one-eyed") (died, c. 1568–1570) and his wife Stepanida Ivanovna. His older brother Vasily died young and without issue. Godunov's career began at the court of Ivan the Terrible. He is mentioned in 1570 for taking part in the Serpeisk campaign as an archer of the guard. The following year he became an oprichnik – a member of Ivan's personal guard and secret police. In 1570/1571, Godunov strengthened his position at court by his marriage to Maria Grigorievna Skuratova-Belskaya, the daughter of Malyuta Skuratov-Belskiy, head of the oprichniks. In 1580, the Tsar chose Boris Godunov's sister Irina Godunova (1557 – 26 October/23 November 1603) to be the wife of his second son and eventual heir, the fourteen-year-old Feodor Ivanovich (1557–1598). On this occasion, Godunov was promoted to the rank of Boyar. On 15 November 1581, Godunov was present when the Tsar murdered his own eldest son, the crown prince Ivan. Godunov tried to intervene but received blows from the Tsar's sceptre. The elder Ivan immediately repented, and Godunov rushed to get help for the Tsarevich, who died four days later. Three years later, on his deathbed, Ivan IV appointed a council consisting of Godunov, Feodor Nikitich Romanov, Vasili Shuiski and others to guide his son and successor of Russia Feodor I, who was feeble both in mind and body: "he took refuge from the dangers of the palace in devotion to religion; and though his people called him a saint, they recognized that he lacked the iron to govern men." Upon his death, Ivan also left the three-year-old Dmitry Ivanovich (1581–1591), from his seventh and last marriage. Since the Orthodox Church recognized legitimate only his first three marriages, and any offspring thereof, Dmitri (and his mother's family) had no claim to the throne. Still, taking no chances, shortly after Ivan's death the Council had both Dmitri and his mother Maria Nagaya moved to Uglich, some 120 miles north of Moscow. Dmitri died there in 1591 at the age of ten in suspicious circumstances. As Dmitri's death was announced by the church bell, the people of Uglich rose up in protest against what they suspected was an assassination commissioned by Boris Godunov. Troops were sent and the rebellion was swiftly quelled. Then Boris Godunov ordered the Uglich bell clapper – "tongue" – to be removed, the bell to be flogged in public and sent to exile in Siberia along with the townspeople who had not been executed. An official commission headed by Vasili Shuiski was sent to determine the cause of death. The official verdict was that the boy had cut his throat during an epileptic seizure. Ivan's widow claimed that her son had been murdered by Godunov's agents. Godunov's guilt was never established and shortly thereafter Dmitri's mother was forced to take the veil. Dmitry Ivanovich was laid to rest and promptly, though temporarily, forgotten. At the coronation of Feodor Ivanovich as Tsar Feodor I on 31 May 1584, Boris received honors and riches as a member of the regency council, in which he held the second place during the life of the Tsar's uncle Nikita Romanovich. When Nikita died in 1586, Boris had no serious rival for the regency. A conspiracy of other boyars and of Dionysius II, Metropolitan of Moscow, sought to break Boris's power by divorcing the Tsar from Godunov's childless sister. The attempt proved unsuccessful, and the conspirators were banished or sent to monasteries. After that, Godunov remained supreme in Russia and he corresponded with foreign princes as their equal. His policy was generally pacific and always prudent. In 1595, he recovered from Sweden some towns lost during the former reign. Five years previously he had defeated a Tatar raid upon Moscow, for which he received the title of Konyushy, an obsolete dignity even higher than that of Boyar. He supported an anti-Turkish faction in the Crimea and gave the Khan subsidies in his war against the sultan. Godunov encouraged English merchants to trade with Russia by exempting them from duties. He built towns and fortresses along the north-eastern and south-eastern borders of Russia to keep the Tatar and Finnic tribes in order. These included Samara, Saratov, Voronezh, and Tsaritsyn, as well as other lesser towns. He colonized Siberia with scores of new settlements, including Tobolsk. During his rule, the Russian Orthodox Church received its patriarchate, placing it on an equal footing with the ancient Eastern churches and freeing it from the influence of the Patriarch of Constantinople. This pleased the Tsar, as Feodor took a great interest in church affairs. On the death of the childless Feodor on 7 January 1598, as well as the rumored assassination of Feodor's much younger brother Dimitry, supposedly ordered by Boris himself to guarantee his seat on the throne, self-preservation as much as ambition led Boris to seize the throne. Had he not done so, the mildest treatment he could have hoped for would have been lifelong seclusion in a monastery. His election was proposed by Patriarch Job of Moscow, who believed that Boris was the one man capable of coping with the difficulties of the situation. Boris, however, would accept the throne only from the Zemsky Sobor (national assembly), which met on 17 February and unanimously elected him on 21 February. On 1 September, he was solemnly crowned tsar. During the first years of his reign, he was both popular and prosperous, and ruled well. He recognized the need for Russia to catch up with the intellectual progress of the West and did his best to bring about educational and social reforms. He was the first tsar to import foreign teachers on a large scale, the first to send young Russians abroad to be educated, and the first to allow Lutheran churches to be built in Russia. After the Russo–Swedish War (1590–1595), he pursued gaining access to the Baltic Sea and attempted to obtain Livonia by diplomatic means. He cultivated friendly relations with the Scandinavians and hoped to take a bride from a foreign royal house, thereby increasing the dignity of his own dynasty. However he declined the personal union proposed to him in 1600 by the diplomatic mission led by Lew Sapieha from the Polish-Lithuanian Commonwealth. Boris died after a lengthy illness and a stroke on 13/23 April 1605. He left one son, Feodor II, who succeeded him and ruled for only a few months, until he and Boris' widow were murdered by the enemies of the Godunovs in Moscow on 10/20 June 1605. Boris's first son, Ivan, was born in 1587 and died in 1588. His daughter, Xenia, was born in 1582. She was engaged to Johann of Schleswig-Holstein, but he died shortly before their planned wedding in October 1602. Xenia was given the name "Olga" upon being forced to take monastic vows at the Voskresensky Monastery in Beloozero and her name is inscribed as "the Nun Olga Borisovna" at the crypt of the Godunovs at the Trinity Lavra of St. Sergius where she lived from 1606, when she sojourned there to attend the reburial of her father, until her death in 1622. Boris, his wife, and their children are buried together in a mausoleum near the entrance of the Assumption Cathedral at Trinity-St. Sergius Lavra. 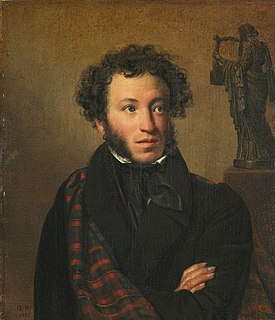 Boris' life was dramatised by the founder of Russian literature, Alexander Pushkin, in his play Boris Godunov (1831), which was inspired by Shakespeare's Henry IV. Modest Mussorgsky based his opera Boris Godunov on Pushkin's play. Sergei Prokofiev later wrote incidental music for Pushkin's drama. In 1997, the score of a 1710 baroque opera based on the reign of Boris by German composer Johann Mattheson was rediscovered in Armenia and returned to Hamburg, Germany. This opera, never performed during the composer's lifetime, had its world premiere in 2005 at the Boston Early Music Festival & Exhibition. Boris was portrayed on BBC Radio 4 by Shaun Dooley in the radio plays Ivan the Terrible: Absolute Power and Boris Godunov: Ghosts written by Mike Walker and which were the first two plays in the first series of Tsar. The plays were broadcast on 11 and 18 September 2016. The character Boris Badenov in the cartoon The Rocky and Bullwinkle Show takes his name from a play on Godunov's name. ^ "Godunov". Random House Webster's Unabridged Dictionary. Sergyei Mikhailivich Solovev, History of Russia (Rus.) (2nd ed., vols. vii.-viii., St Petersburg, 1897). ^ Troyat, Henri (1993). Ivan le terrible. Flammarion. p. 284. ISBN 2-08-064473-4. ^ a b Durant, Will (1961). "The Story of Civilization". VII—"The Age of Reason Begins". Simon & Schuster: 513. ^ Haywood, Anthony, Siberia: A Cultural History, Signal Books Ltd, 2010, 288 p., ISBN 978-1904955689, p. 80. ^ Pushkareva, Natalia (1997). Women in Russian History: From the Tenth to the Twentieth Century (New Russian History). M. E. Sharpe, Inc. p. 319. ISBN 1-56324-798-4. ^ "Ivan the Terrible: Absolute Power, Tsar, Drama - BBC Radio 4". BBC. Retrieved 19 March 2018. ^ "Boris Godunov: Ghosts, Tsar, Drama - BBC Radio 4". BBC. Retrieved 19 March 2018. Fyodor I Ivanovich or Feodor I Ioannovich ; 31 May 1557 – 16 January (NS) 1598), also known as Feodor the Bellringer, was the last Rurikid Tsar of Russia (1584–1598). Fyodor II Borisovich Godunov was tsar of Russia in 1605, during the Time of Troubles. Dmitry I was the Tsar of Russia from 10 June 1605 until his death on 17 May 1606 under the name of Dmitry Ivanovich. According to historian Chester S.L. Dunning, Dmitry was "the only Tsar ever raised to the throne by means of a military campaign and popular uprisings". Maria Feodorovna Nagaya was a Russian tsaritsa and fifth uncanonical wife of Ivan the Terrible. 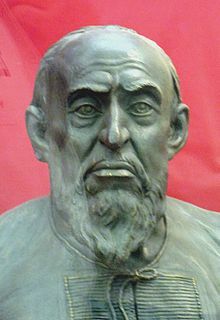 Tsarevich Dmitry or Dmitri Ivanovich, also known as Dmitry of Uglich or Dmitry of Moscow, was a Russian tsarevich famously impersonated by a series of pretenders after the death of his father Ivan the Terrible. Vasili IV was Tsar of Russia between 1606 and 1610 after the murder of False Dmitriy I. His reign fell during the Time of Troubles. He was the only member of House of Shuysky to become Tsar and the last member of the Rurikid dynasty to rule. Feodor Nikitich Romanov was a Russian boyar who after temporary disgrace rose to become patriarch of Moscow as Filaret, and became de facto ruler of Russia during the reign of his son, Mikhail Feodorovich. Bogdan Yakovlevich Belsky was a Russian statesman and a close associate of Ivan the Terrible. 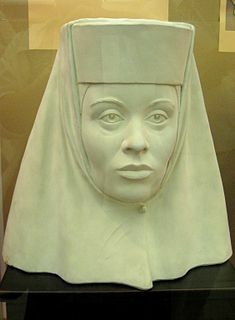 Saint Solomonia Yuryevna Saburova was the first wife of Grand Prince Vasili III of Muscovy. She was canonized by the Russian Orthodox Church as Saint Sofia of Suzdal. Irina Feodorovna Godunova later Alexandra (1557–1603) was a Tsaritsa of Russia by marriage to Tsar Feodor I Ivanovich and the sister of Tsar Boris Godunov. For nine days after the death of her spouse in 1598, she upheld a dubious power position as de facto autocrat. Aleksandr Vishnevsky was a Russian actor and one of the founding members of the Moscow Art Theatre. Boris Godunov is a 1986 drama film directed by and starring Sergei Bondarchuk. It is an adaptation of the play Boris Godunov, written by Alexander Pushkin. The picture was co-produced by the Soviet Union, Poland, Czechoslovakia, and West Germany. It was entered into the 1986 Cannes Film Festival. Maria Grigorievna Skuratova-Belskaya, was a Tsaritsa of Russia as the spouse of Tsar Boris Godunov. She served as regent of Russia during the minority of her son, Tsar Feodor II of Russia, in 1605.